Clayton Bailey, Dangerous Brain Bowl, 1974. 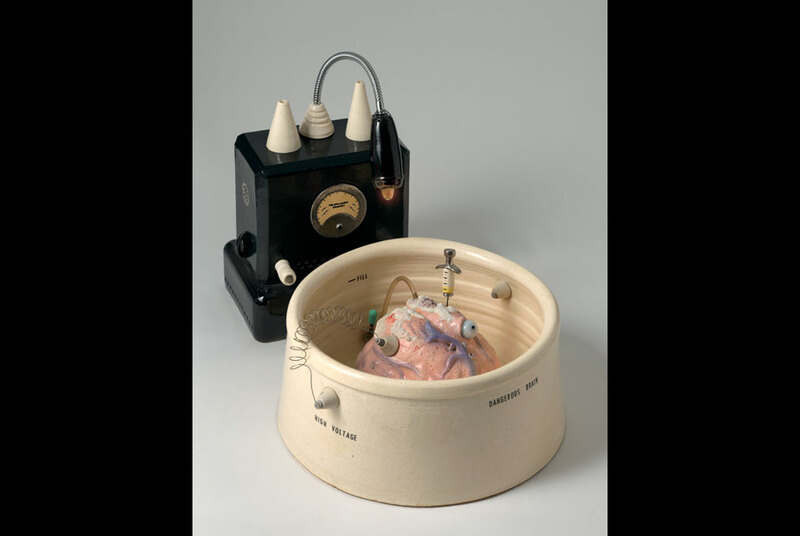 Ceramic with luster glaze, china paint, metal wire, metal gooseneck, and electric illumination, 20 × 18 × 34 in. (two elements) Crocker Art Museum, gift of Paula and Ross Turk. SACRAMENTO, CA.- The Crocker Art Museum presents the first career-spanning retrospective of the work of contemporary sculptor Clayton Bailey in the new exhibition Clayton Baileys World of Wonders. Featuring 180 works and ephemera encompassing Bailey's 50-year career, this exhibition will be on view from October 22 through January 15, 2012. Bailey studied with Harvey Littleton, the father of the contemporary glass movement, at the University of Wisconsin. Visiting instructors Bernard Leach, Toshiko Takaezu, and Peter Voulkos further shaped his approach. Bailey moved to California in 1968, settled in the Bay Area, and became a leading educator, teaching at California State University, Hayward for 26 years. His work is represented in collections from the Los Angeles County Museum of Art to the Renwick Gallery of the Smithsonian Institution. National Portrait Gallery in London opens "The First Actresses: Nell Gwyn to Sarah Siddons"